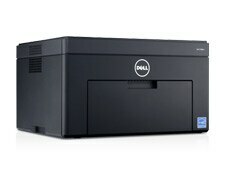 Dell LED Printers vs. Dell Laser Printers – understand LED printing and the benefits from Dell Color LED printers. Uses a print head consisting of an array of solid state light emitting diodes (LEDs) for light generation, built across the width of the drum. 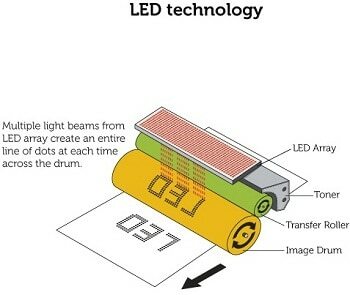 The print head flashes light across the entire width of the drum, creating an entire line of dots at the same time. 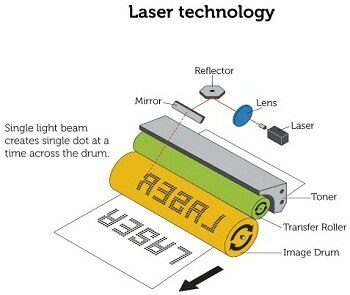 Laser printing, also known as Laser Raster Output Scanner (ROS), uses a single light beam to scan and create an image. The light beam is directed across the drum, using a complex combination of rotating mirrors and lenses, creating each line of dots, one dot at a time. Recent advancements in LED printing technology have seen vast improvements in print quality of conventional LED printers, making them a good alternative choice over Laser printers. The short optical path for the LED printhead allows LED printers to be compact in size compared to Laser printers. With simple mechanical parts, conventional LED printers are also reliable with low noise levels during printing, compared to complex rotating mirrors and lenses used in Laser printers. Dell Clear View LED – Technology that’s clearly a step ahead. Excellent print quality. Great accuracy, control and uniform light emission with an intelligent self-scanning LED print head. Maximize your workspace. A small print head allows for ultra-compact printer design. Reliable and lasting performance. From simple mechanical parts. Low maintenance. Drum and fuser unit designed to last the lifetime of the printer*. Simple design removes need for maintenance kit and replacing waste toner box. Only four toner consumables need to be replaced. Energy efficient. An enhanced image controller uses low power during printing. Color by Dell – A whole new level of picture quality. Amazing color. A sophisticated print engine design and transfer belt that transfers four colors simultaneously for excellent color registration and color saturation. High print quality finish. With advanced toner technology, you get consistent print quality and more saturated color reproduction with an excellent finish on coated paper for eye-catching business graphics or text. Superb image quality and print speeds. Image enhancement technology that gives excellent color reproduction with sharp and crisp text quality on white, black or colored backgrounds, at fast print speeds. Ultra-compact color LED printer with superb print quality. 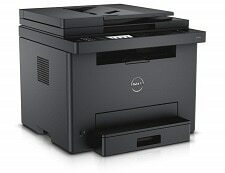 Ultra-compact color LED network printer with superb print quality and WiFi connectivity.